11-Aug-2006 -- We had been planning to go to this confluence for the past two years. Practicing winter time seaswimming was part of the preperation. Finally we decided to go for it. We drove from Reykjavik to nearby town of Súðavík, a distance of 442 kilometers. Arriving at around 10 in the evening we were tempted to go straight to the confluence as the weather was beautiful and the fjord was like a mirror. But the daylight was fading and we wanted to get good photos. We had rented an apartment in Súðavík so we went there and had dinner. The Town of Súðavík was hit by avalanche on the morning of january 16th 1995 and the houses that were deemed unhabitable in winter because of the danger of further avalanches, are now available for summer vacation lodging. 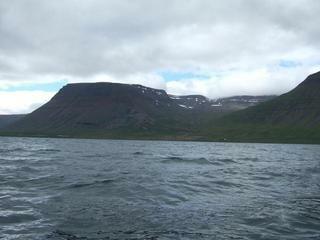 On the Friday morning we drove to Sjötúnahlíð (Slope of seven meadows) where it is shortest to swim to the confluence. The story tells that the steep and arid slope was divided up into seven farms but there are no visible remains of those farms. We were able to park our two cars about 50 meters from the spot in the seashore where we wanted to go out. There is a steep climb from the road down to the shore of about 20 meters. From the shore, the confluence is about 270 meters straight west. The weather was a typical nice icelandic summer weather of 12-13°C and a light wind from south of 3-5m/s. The temperture of the sea was 9°C and we had good wetsuits to protect us from the cold. We had also bought a small inflatable boats for safety and photograhy purposes. The trip out to the confluence was straightforward and we could reach it in about 10 minutes. One of us was swimming and four of us were in the boats. The problem was a to get the correct photographs because of heavy drift. On top of the wind blowing the sea current was carrying us quite fast from the spot. Cars passing by didn´t pay us any special attention but there was a grey seal (Halichoerus grypus) nearby monitoring our movements we also encountered some giant jellyfishes. When we had gotten sufficient photos we went ashore three swimming and two in boats, but it was hard as we were getting cold and very tired. We spent excactly 1 hour in the sea and looking at the track realizing it was 2.1km long. After a light lunch we drove 437km straight back to Reykjavik. About 200 m offshore in the waters of a fjord.